Red has really been my go to color lately. These Shoes and this Necklace are constantly in rotation. I love when I wear the hell out of something and really feel like I got my moneys worth. I'm trying to buy less and focus on mixing things up more. I used to mix things up so much more before I had a child, and I used to have so much fun getting dressed. Now, I only have fun getting dressed when I actually have the time to do it and when I'm not exhausted, which is rare...between my dog, my 2 year old and my husband, I'm getting woken up a few times a night. I think they collaborated and decided to do this on rotation. Toddler takes the 2 am shift, husband takes the 4 am shift (he gets up and fiddles with his phone or messes with the air conditioning) and the dog licks my face around 6am or pushes his paws into my back. PS, I'm thinking of coming up with a fall fashion trend tips list...will keep you posted! I love this! 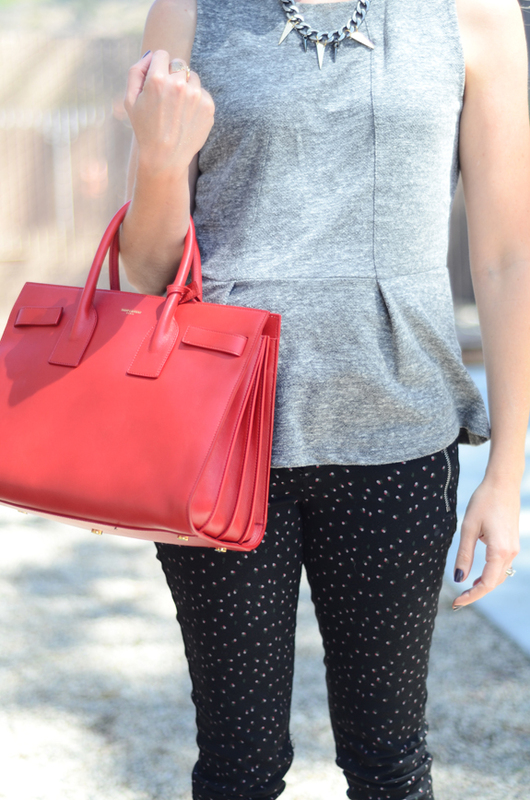 The pops of red are just perfect. Adore that relaxed peplum top! It looks so cozy and chic! I'm such a grouch when I'm woken up, will definitely take some getting used to once I have a kid, pup, or husband!! Ha. I adore this look! I'm always a huge fan of red shoes-you can't go wrong with a bright pop of red on your feet. I also love the spotted pants, they're so unique and fun! You look amazing. Thank you so much for stopping by my blog to have a read--it completely made my day!